1. A new policy for disaster recovery requires copying all critical network configurations and operating systems to a backup server that will be stored offsite. Which command will create a backup of the switch IOS image on the server? 3. An administrator is using the switch help facility to find the command elements available to the configure command. What would the user type at the command prompt to display the next set of arguments available in the syntax for this command? 4. Which switch command mode should always be password protected? 5. What must be done in order to initiate the password recovery procedure on a Catalyst 2900 series switch? Enter the setup program by deleting the switch configuration file and rebooting the switch. Hold down the MODE button during switch startup. Wait for the STAT LED to turn green while holding down the Break key. Hold down the Ctrl-Break keys during switch startup. 6. Which protocol is used to copy a new IOS image to a Catalyst switch during the upgrade procedure? The hosts will negotiate 10 Mbps or 100 Mbps bandwidth with the switch, as required by their NICs. The hosts will be in separate broadcast domains. All of the hosts will be in the same VLAN. Hosts with 10 Mbps NICs will be unable to communicate with the network. All of the hosts should be able to send and receive ARP messages from each other. All of the hosts connected by Ethernet can manage the switch over Telnet or HTTP. 8. A workstation on a switched Ethernet LAN is to be upgraded with a new Fast Ethernet NIC. What should be done to ensure that the workstation will be able to gain access to the network? 9. Although the backup configuration file on a Catalyst 2950 switch has been erased, it is found that VLANs are still configured in the switch. What must be done to clear the configured VLANs? The vlan.dat file must be erased and the switch reloaded. The switch flash memory must be purged and the switch rebooted. The vlan.cfg file must be renamed and IOS restarted. Each VLAN needs to be deleted individually and the configuration saved. The switch needs to be restarted, because the old running configuration is still in memory. 10. Which type of cable is used to connect to the console port on a switch? 11. 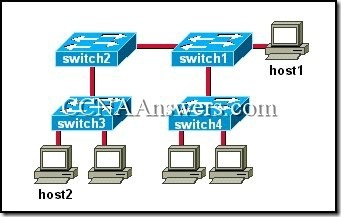 From which switch command mode can the configure command be used? 14. 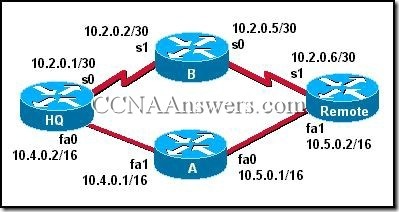 How long will a host MAC address remain in the address table of a switch after the host has been turned off or moved to another device? 15. What is the name of the series of tests that execute every time a switch is powered on? The switch is negotiating full or half-duplex mode. The switch has completed negotiating 10 or 100 Mbps speed. The boot sequence is in process. The switch is operating properly and is ready for service. 17. When the copy tftp flash command is used to upgrade the IOS on a switch, which symbol indicates that the image was copied successfully? 18. What color is the System LED if the switch fails the POST? Host MAC addresses can be statically assigned to each switch port. Layer 2 access control lists can be used to prevent unauthorized network access. Unused ports can be shutdown. Passwords and usernames can be set for each Ethernet switch port. Unused switch ports can be assigned to the management VLAN. Port security can be activated to allow only the host with the first MAC address learned on a port to access the network.